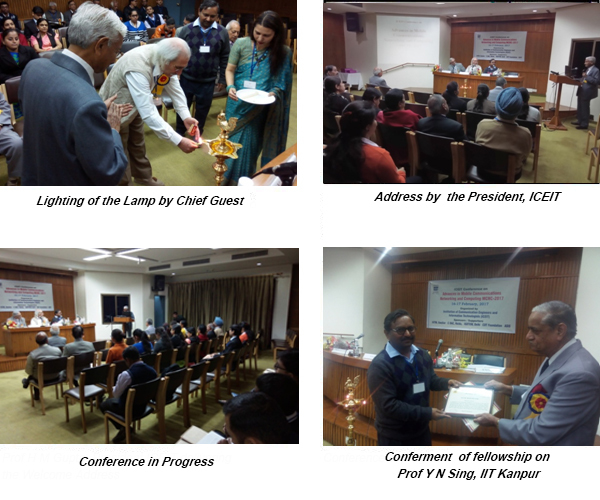 ICEIT Convention and Conference were held successfully on 16-17 February 2017 at the India International Centre (Annexe), New Delhi. The theme of the conference was Advances in Mobile Communications, Networking and Computing. More than seventy professionals attended the convention and the conference. The participants included Telecommunication System Technologists and Managers, Government Departments and Agencies, Academic and R&D Institutions. Workshop on Recent Advances in ICT at DAVV, Indore on Engineers Day, September 15, 2012.
International Conference on Mobile for Development (M4D) organized by Human IT Group of Karlstad University, Sweden and Society for Education and Research Development(SERD) on 28-29 February, 2012 at Delhi. I welcome the focus on women and girls as the theme of this year's World Telecommunication and Information Society Day. Information and communications technologies are already benefiting women and girls in numerous ways. E-commerce is expanding opportunities for entrepreneurship. Mobile telephones are enabling midwives to make childbirth safer. Electronic social networks are allowing women around the world to mobilize as never before for democracy, dignity and human rights. At the same time, we know that information and communications technology has the potential to cause harm. Cyberbullying, Internet-driven human trafficking and other abuses are often targeted at women and girls. We must do everything possible to stop these crimes and promote greater online security for all people. More broadly, we should work to optimize the power of information and communications technology to support sustainable development. By gathering, disseminating and analyzing information, we can accelerate action to protect natural resources, combat climate change and help vulnerable people, including women and girls. This is especially important in the context of the "Rio+20" United Nations Conference on Sustainable Development, to be held next month in Brazil. In the final run-up to the Conference, and then especially afterwards as we implement the decisions taken there, information and communications technology can make possible new approaches and solutions for a sustainable future. On this World Telecommunication and Information Society Day, I call again for wide-ranging efforts to close both the digital divide and the gender gap. All people must be able to make the best use of information and communications technology to help create the future we want.
" Women and Girls in ICT "
ICTs play a catalytic role in creating opportunities for people in every walk of life, especially for those among us who are vulnerable and disadvantaged, while providing the framework for long-term sustainable development. This year, on World Telecommunication and Information Society Day, we are determined to harness the full potential of ICTs for the benefit of women and girls by eliminating gender disparities and empowering them to meet their goals and aspirations. The theme of this year's WTISD, "Women and Girls in ICT", aims to ensure that this significant, female half of the world's population will march forward as equals. This situation is unacceptable and we must address it with all the means available to us. Gender equality is a basic human right enshrined in the UN Charter, and it is one of the main objectives of the UN Millennium Development Goals (MDGs). ICTs are tools that can help accelerate progress towards achieving this target, and it is for this reason that ITU Council proposed that we focus our efforts this year on women and girls, using the power of ICTs to provide new digital opportunities to end discrimination and empower women and girls to achieve their rightful place as equals in the world. This effort with ICTs must begin not only from the cradle, but from antenatal health care, reaching out to the remotest communities through telemedicine and other means ― with every mother, every girl and every woman guaranteed her birthright. I call upon ITU Member States, Sector Members and Associates as well as academia and citizens' groups to pull together every conceivable resource to ensure that women and girls in every community around the world have full access to ICTs in order to empower them with information and knowledge, to know their rights, and to seize every available digital opportunity. I also call upon our other partners and stakeholders ― political leaders, policy makers, regulators, operators, industry and civil society ― to adopt policies and strategies that will promote ICT opportunities for women and girls. National governments, private sector, donors, civil society and educationists need to acknowledge and support the central role professional women can play in further developing and servicing a dynamic and competitive ICT sector. The growing demand for a range of ICT skills around the globe present a unique window of opportunity to properly position girls and women in the industry and provide them with the tools necessary to succeed. The ICT sector in particular can pave the way by providing avenues of advancement to professional women at the highest echelons of decision making and by encouraging young women to seek new careers within the sector. I urge you to celebrate World Telecommunication and Information Society Day this year by paying particular attention to the special needs of women and girls, extending to them the benefits of ICTs so as to create a paradigm shift in opportunities offered now and in the future. An egalitarian and just society is the basis for a peaceful and prosperous world.